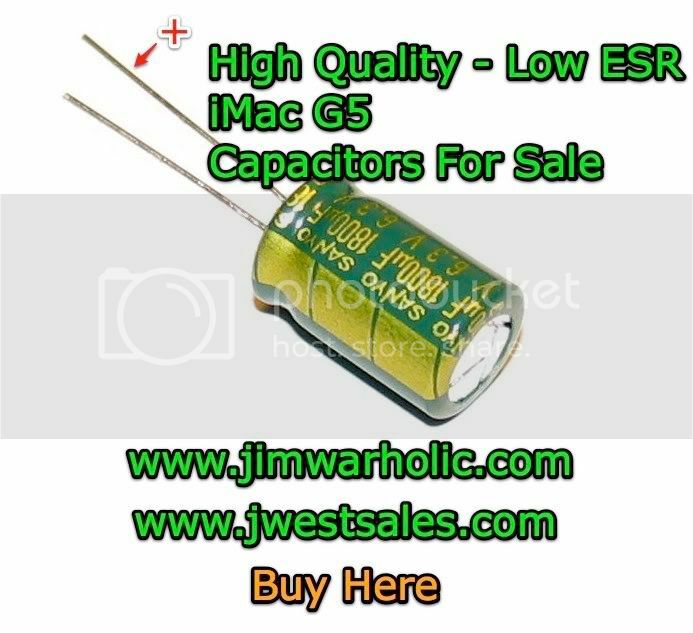 Purchase high quality, low ESR, motherboard grade, long life, high temperature rated capacitors for your iMac G5 motherboards and PSUs. Help please, my beautiful Apple iMac G5 Computer is broken. The first in a series of how to fix an iMac G5 PowerPC mother board (MOB). This procedure is for repairing the iMac G5 MOB Logic Board and video problems. For Apple iMac G5 PSU, see how to fix an iMac G5 power supply. Click here for Apple iSight G5 logic board model information. The success rate for these do-it-yourself repairs are quite high, at greater than 95% when following the instructions. *** See note at the end of the article. Hello to the French MacGeneration. Bonjour à la France MacGeneration. Translate this page using Google Translate Widget on the right. Traduire cette page en utilisant Google Translate widget sur la droite. I had to get the lead out when it comes to repairing the Apple iMac G5 PPC motherboard problems. Beware; please read these MOB iMac G5 repair instructions carefully before attempting this procedure for replacing of the capacitors on an iMac yourself. This Apple iMac G5 logic board repair is not as difficult as it sounds. If you wish to save a substantial amount of money on iMac repairs and mother board replacement, possibly have a buddy that can help, or even have some experience yourself with a few handy tools at your disposal, or have a local computer repair technician that might be willing to do the job, or willing to take on a challenge yourself and have a dead mac you wish to revive, then this is the best Apple iMac G5 repair procedure for you. Also, beware of the time commitment involved with this Apple computer repair. “Be prepared,” is the old Boy Scout motto, and that is no lie when it comes to tackling this Apple product repair yourself. iMac serial numbers are listed below to see if your Apple serial number was covered in the original problem. Additionally you may also go to any Apple Retail Store with a Genus Bar, and have the Apple folks take a look inside the G5 and look at the caps on the iMac logic board for you. Find the nearest Apple Retail Store – Genius Bar in your area, and take your Mac and get in the queue, or better yet, make an appointment online for the Genius Bar. Apple provides technical support for Mac, iPod, Apple TV, and iPhones at the Genius Bar too. ›Apple iMac G5 Hard Drive Data Recovery for those that want to recover the information from their hard drives on a dead Mac. 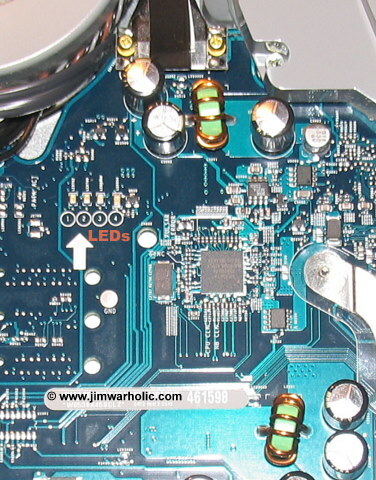 This is a close up view of the Apple iMac G5 Motherboard (20 inch model) with the bulging, leaking, and exploding capacitors problem. Take a look at Fat Caps & Ripple Current for more info into engineering and design of electronics equipment. This is a first generation model pictured above. Go to the bottom for second generation iMac G5 comparison picture. This Apple G5 PPC motherboard is three years and two months old. The symptoms of the problem were: video shaking, video disappearing, video lockup, system lockup, intermittently could not power down, intermittently powering up problems, and strange program lockups. Here is a YouTube Video from someone else that shows a very similar Apple iMac G5 startup problem with the video display. Note the vertical lines in the video display. Article updated 12/17/11: Very Important! High Quality Low ESR capacitors, computer motherboard grade, 105ºC, 10mm X 16mm, caps are available for sale in kit form. The logic board capacitor sizes included in the kits, are the original sizes of the capacitors on the logic board; making your job much easier to replace them. Important Note: The caps are a perfect fit for both diameter and height requirements, which is very important for the caps’ clearances to the back cover and extremely close mounting requirements. Reference the article: Fat Caps & Ripple Current for more electronics engineering & design insights. International shipping is available for most countries worldwide. If your country isn’t listed for a shipping destination, please let me know to add your country to the list. Please provide your full name (first and last name) when ordering capacitors. Please refer to the Shipping Page for ordering and shipping information. Send me an email if you would like to purchase ten or more iMac G5 cap kits, along with a note of which of the different cap kit sets you are interested in. Note: Apple early and late model iMac G5s with the PowerPC processor have different quantities of caps required on the MOB. Capacitor information is provided at my secure eCommerce website. 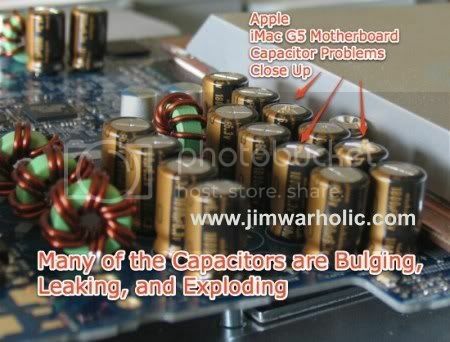 Visually verify what capacitors your Apple iMac requires based on the pictures, and bring your iMac G5 back to life today. Send me an email with any questions, or other special order requests. I have the power supply cap kits available too. Compare your PSU to the pictures. Feel free to contact me any time, with any questions. Take a look at the PSU cap kits that are available for purchase. Apple iMac G5 Motherboard PowerPC capacitors replaced. 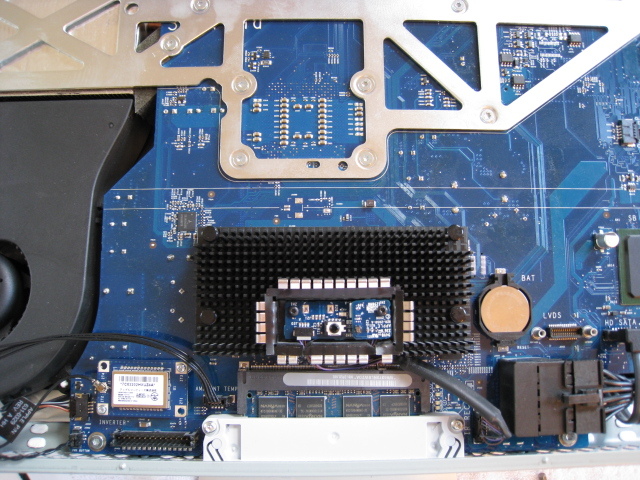 The iMac mother board pictured above shows the locations of the new capacitors installed. Note: The heights and diameters of the new capacitors are slightly bigger in this picture, than the original caps. Upgraded to 1,800 uf 10 volts from the original 1,800 uf 6.3 volts. Please note these were larger diameters and taller than the original ones. They were a very tight squeeze between each of the caps. Back cover still clears (barely clears) all components. This information is for documentation sake. I don’t really recommend going up in the heights and diameters here. That is why I am selling the proper size caps for the mother board. If higher voltage caps, with the correct capacitance, good maximum current ratings, low ESR ratings, and temperature ratings were available, in the same exact physical case sizes, it would be OK to install those. However, higher voltage caps are not available in this size packaging. Important notes are as follows. It appears as though lead free solder was used and a polymer was coated on the assembled motherboard on the bottom. A very hot soldering iron is required. Doing it yourself is not for the faint at heart. But fear not, you can do it if you follow this procedure. It’s pretty easy to open the iMac case (first and second generation iMac models) and visually look at the caps. Simply lay it face down on a soft cloth. Loosen completely, the three screws on the bottom edge (Note: the screws will stay in), then just lift the back cover off from the bottom up. Visually inspect the capacitors for signs of expansion or tops that are rounded even slightly are an indication of bad caps. Once you determine the status of the caps, then everything has to be disassembled, beginning with the removal of the power supply, which also can be a victim of bad caps and/or poor engineering, (see: DIY G5 power supply repair) in order to get to the bottom of the motherboard. Refer to the various Apple iMac G5 user and do-it-yourself part replacement manuals for details and visual instructions on how to remove various items. The cover is easy to take off by simply turning the three screws completely counter clockwise on the bottom of the computer’s lower edge and then lifting up the rear cover. The power supply (see: Apple Power Supply Removal and Replacement Instructions) then can be removed by unscrewing the mounting screws and disconnecting the main plug and the ambient light sensor cable (if you have an ambient light sensor model) to the motherboard, and partially turn the middle screw (about 5 turns clockwise) on the bottom of the case, which releases the back cover clamp, and the PSU will then lift out. Be careful not to damage the automatic ambient light sensor mounted on the bottom edge of the power supply unit. See this YouTube Video for what is inside the iMac G5 Computer. However once the cover is removed, the rest of the computer disassembly is quite a delicate task for most non technical people and requires special tools. Apple never actually intended for the end user to remove everything that I removed in order to get to the root of the matter. A Torx screwdriver is not necessarily needed, though it would be helpful to use one. Check out the very handy magic screwdriver with the telescopic shaft with various size TORX bits for the mother board and other items. I had some precision screwdrivers that fit somewhat precisely in the fasteners, but it certainly would have been easier if I had the Torx screwdriver to begin with. o small a tip, the heat will not transfer to the mother board very well, and the tip will cool down too fast when trying to melt the lead-free solder. If anyone would like to make a suggestion for a good quality soldering iron, at a reasonable price, with quick heat recovery, that can melt the lead free solder on this Apple motherboard, let us know here. While removing the 20 capacitors on the G5 logic board, I experienced broken leads from capacitors that were falling apart, and leads that pulled out of the capacitors themselves, because of the extra heat that is required to melt the lead free solder in the first place. Note the following section is included for information purposes only. Some folks have recommended I remove this reference to drilling the circuit board holes out. While this is not a recommendation of circuit board drilling, I have included it here only as to what I had to do to fix the problem. Others may have a much better “hole” cleaning solution. In fact, I highly recommend reading about the “pin point tip” desoldering trick, the new Chip Quik desoldering alloy and flux, and the importance of using a proper soldering iron first. To begin with, I had to use a Dremel power tool in various ways, though with a hotter and greater wattage soldering iron designed for lead-free soldering, which I bought for future MOB repairs, the following would have been a non issue. Prior to removal of the G5 caps, it was first necessary to grind off the polymer resin and some of the excessive lead lengths from the old capacitors with a small grinder tool attached to the Dremel, and then drilling out some circuit board holes with a number 72 (0.0250 inch) solid carbide drill was what I did when the old cap leads broke off in the holes of the printed circuit board. Beware of, drilling the holes out could damage the circuit board and break carbide bits inside the holes. That would not be good and making it most difficult to fix. Suggest using the Chip Quik desoldering product here instead of drilling out the pads on the PCB. Also note that drilling the holes can damage the through platting which is designed for connecting the top and bottom hole surfaces of the PCB, and might also be used for connecting to other traces and layers of the multilayer PC board. This would also make for a really bad through solder hole connection on the new capacitors being installed. When replacing the capacitors it is important to note which are the positive and which are the negative leads when installing in the board. New capacitors generally have a long and short lead (short lead is usually the negative lead) along with a negative indicator written on the side of the cap itself. Warning: Do not install capacitors in backwards, or you will blow up the new caps and possibly damage the circuit board. The circuit board has the positive hole marked on the printed circuit board itself. Here is a how-to demonstration of how to replace capacitors. Also, keep in mind when soldering your new capacitors to the motherboard, if you just have a round blob of solder on the bottom of the board, without it fully flowing through the holes, you can have cold solder joints. If you place heat on the legs of the caps for too long, you can also damage the new capacitors. A very hot soldering iron with quick heat recovery, and a wide tip is the best solution. See notes above about the recommended soldering iron. 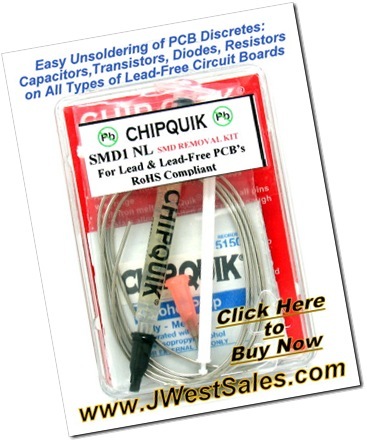 More information at: Soldering Tips For Lead-Free Soldering. Special Attention to Details Area. At this point in the iMac repair process, after the new caps are completely installed, and properly soldered in the holes on the motherboard, you must trim off the excess new caps’ lead lengths on the bottom surface of the motherboard. Take a pair of diagonal cutters, and snip the leads to the proper lengths, making sure you do not get any metal fragments lodged in the motherboard or inside the chassis area of the iMac computer. Failure to cut the leads to the proper lengths could result in short-circuits, damaged capacitors, blown electronic components, and a blown iMac motherboard or power supply unit. Once the capacitors are replaced on top of the motherboard, then it is time to reinstall the motherboard back into the chassis. Pictured above is the bottom of the MOB logic card, with the small square just to the right of the “.com” which is the location of the main processor (CPU) that protrudes from the bottom of the logic card. Do not try to remove this processor chip. Clean this area and the metal heatsink area that matches up to the CPU with alcohol, and apply fresh heat sink compound. I suggest when ordering the capacitors that you also order the thermal paste heatsink compound at the same time. You can order the thermal compound online from my J West Sales Store. The first thing the CPU does, based on ROM instructions, is check the RAM. If the RAM is OK the chime sounds. Therefore, if there is no chime, either the CPU is not working properly or a RAM chip is defective. This test covers the basic hardware and comes before the hard drive boot starts. The 3rd LED comes on early in the hard drive boot, but definitely after the chime. My problem was no chime, and the reason was that the CPU wasn’t working. The CPU wasn’t working because I slopped some thermal grease over the circuit board items above the CPU. These items are marked “RAM clock” on the board. Internet research revealed that the thermal grease is full of metallic silver. Furthermore, although there is little or no electrical conductivity, the grease is very capacitive. If it is sitting on the components, or even above the insulating copper tracings of the circuit board, it has low impedance at the clock frequency — it is a virtual short circuit. Once I cleaned off the grease, the board worked properly. Arctic Silver Inc. manufactures a very good quality thermally conductive grease for modern high-power CPUs for Apple, Intel, and AMD, along with other high-performance heatsinks or water-cooling applications. Arctic Silver manufactures the Arctic Silver 5 product and the Arctic Silver Ceramique thermal compounds, and are world renown as being two of the best thermal heatsink compound options available. CPU Overclockers rave over Arctic Silver products. When applying the Arctic Silver thermal paste compound (either the Arctic Silver 5 or Céramique 2), less is better, (see the warning on the left) paper thin is best. Please review instruction sheets for applying Arctic Silver 5 and also the Arctic Silver Céramique 2 instructions of use and proper application procedures. On Motorola chips, I use the covering of the whole surface with a very thin layer method as opposed to a dot in the middle method. Just be sure that very little if any comes out of the edge of the chip when the board would make contact with the heat sink. The way the application works is, the thermal paste fills the minor imperfections in the metal surfaces and removes the air spaces between the two joining metal surfaces and helps improve the heat transfer between the CPU and the heatsink. See image above for the the small square area right location, for the thin application of the thermal grease. Check out this Thermal Paste Comparison from Techware Labs review of the pros and cons of using the most popular thermal pastes available at the time the article was written. The article, while being somewhat dated, provides good insights into the differences between Silver Grease and Silicone Paste, and which is better for a computer CPU heatsink application. I would stay away from the silicon paste compound, because quite frankly, silicon paste or silicon grease does a poor job of keeping the CPU cool under load conditions based on the test results at that time. Believe it or not, I have to say the finished project has worked like a champ. As a matter of fact, I have used the same iMac G5 here to do the pictures with a program called Skitch, and posting this article using Firefox running on the iMac too. At this point in time, I’m not sure I would use any of those Rubycon Caps again. As the old saying goes, “Fool me once, shame on you; fool me twice, shame on me.” Rubycon, why did you use an improper electrolytic recipe? Was it cheaper to make those caps with the cheap electrolyte with the missing ingredient? Note: I inspected my work a couple of weeks later, and decided to replace the five other capacitors also. I found some evidence online that these other capacitors go bad too. The 20 capacitors that I first replaced all looked good. Upgraded these five additional caps from the original factory installed 1,000 ufd, 16 vdc caps, to 1,000 ufd, 25 volts DC, operating temperature range: -55º to 105ºC. I should point out here that these were a larger diameter and taller than the original ones. They were a tight squeeze. I picked up both sets of capacitors at Halted Electronics a surplus store in Santa Clara, CA. They also have some new electronic components available at the store too. Generally speaking, it is usually OK, and advisable, to increase the DC voltage rating of the capacitors while maintaining the same MFD, microfarad rating. Don’t cut corners. As a suggestion, if you see any of the capacitors that have problems, it is highly advisable to replace the entire group of caps at the same time. If one or two of the caps are in the failure mode now, they would more than likely all be destined to fail in a very short time. As an aside note, I included the previous paragraph information in this article as a historical troubleshooting and engineering evaluation note. I would suggest not installing surplus caps as a general fix for this problem and subsequently have installed “new” caps in this iMac. The problem with “old” surplus caps, you have no idea how old and long the capacitors have been sitting on the shelf with potential “shelf life rot”. I actually witnessed this capacitor shelf life rot on some of the first capacitors I looked at in the surplus bins before they got more from the back room. Many of the surplus caps are generic brands, or do not have proper low ESR ratings, or are general purpose capacitors that should not be used in mother board applications. Note that as of 8/15/2010, as I mention above, I upgraded this originally repaired iMac G5 with the surplus “old” caps to the proper sized and proper voltage rated “new” capacitors. Don’t shortchange yourself in your repair efforts here; order proper low ESR motherboard and power supply grade capacitors. Another interesting bit of information regarding noisy iMac G5 fans and internal temperatures that I discovered after the G5 motherboard repair, it became apparent, the computer fans were running a lot quieter. No more Hoover Vacuum cleaner sounds. Also, the overall temperature of the computer is operating at lower temperatures in my opinion. I found this free Temperature Monitor program for keeping track both instantaneously and in a graph chart form, of what the CPU, Hard Drive, and Smart Disk drive temperatures are operating at. I did not have the program installed prior to the problem, but after I repaired the printed circuit board, I installed the temperature recorder and discovered that the CPU temperature does not get much above 65 degrees C, even with a warm ambient room temperature. The average temperature of the CPU is somewhere in the 58 degree C range (136 degrees Fahrenheit). Note: I keep my computer running for days and weeks on end. I am still a bit ticked off that I had to go and do this myself. I had the Apple extended care warranty, but I missed out on the free repair by two months. If I had the problem occur two months earlier, Apple would have covered it free of charge. Apple never sent a message concerning the problem. It took some investigative work to find out that they had issues with the capacitors leaking, but they downplayed the severity of the problem. This should not happen with a product three years old. In Apple’s defense I can tell you that I found evidence that many other computer manufacturers also had the capacitor problems from buying low cost capacitors from a stolen electrolytic capacitor recipe from Taiwan. See this video showing computer circuit boards with bulging, leaking, and exploded capacitors on board from a variety of computer manufacturers. While I am a fan of Apple products, I just have to say this is not one of their stellar computer products moments. I’m sure it was a business decision to not have a product recall, but I think they should have had one. Of course, I guess you could say, I’m a little biased on this issue. Yes, the Apple Store folks were nice enough to take a look inside the iMac at the local Mac Genius Bar, and give me a heads up on what the problem was, though it only took a five second look inside for the Apple guy to tell me that I need a new motherboard, and oh by the way, the total cost (approximately $750.00) was going to be two thirds the cost of a brand new computer. The Apple Store guys suggested I buy a new Apple desktop computer, one that is faster and better. Here’s what you get (pictured above) inside the Apple iMac G5 Desktop computer. CD/DVD in the upper left, two fans in the top center, hard drive top right, two memory slots available for up to 2 GB of two 1 GB DDR PC 3200 memory sticks, power supply in the lower section, and the mother board in the middle. Look closely, and you can see the on board battery for the motherboard. Compare your Apple iMac with the picture above. Is yours an early model first generation or late model second generation Apple iMac G5? Printout this PDF file of the Apple iMac G5 Motherboard Repair article for reference before you take a bite of your Apple apart. Opun the back door. Here is a Apple link on how to identify your iMac and how to check the EMC number on the bottom label. As one last thought before the night is over, lead free solder is a pain in the rear. Repairing all types of electronics is going to become increasingly difficult with these high temperatures required to remove and install new components in their place. We are becoming more and more, a disposable society. Also, I think it is quite comical reading the Apple repair extension program especially the section about not fixing the desktop computer yourself, now that I have fixed it myself. And, the one that says if you don’t have any of these problems there is no need to do anything, “just wait for it to break after warranty,” my two cents added. Read it for yourself. I guess I am breaking all the rules here. And for those that want to check out their iMac G5 for the extended service, here is the quoted information from Apple support. The iMac G5 Repair Extension Program for Video and Power Issues applies to first generation iMac G5 computers that have video or power-related issues as a result of a specific component failure. If your iMac G5 is exhibiting any of the symptoms listed below and your computer’s serial number is within the noted ranges, your computer may be eligible for repair, free of charge. If Apple or an Apple Authorized Service Provider (AASP) determines that your iMac G5 computer is eligible as part of the program, the repair will be covered by Apple for up to three years from the original date of purchase even if your iMac G5 is out of warranty. *** Just as a reminder, it is also a good idea to check your iMac G5 power supply. A bad power supply, will produce excessive ripple on the output voltages because of bad internal PSU capacitors, and can cause your new capacitors on the MOB to quickly fail. It is not hard to check the PSU caps. Go to the article on the Apple iMac G5 Power Supply for more detailed information and what you should be aware of. I have the complete PSU cap kits in stock. For a list of the capacitors required on the PSU, take a look at the Inside the Apple iMac information articles. Do a quick visual inspection of the inside of your iMac G5 for bad caps. Replace both types of caps completely even if one or two is visually bad, since it is most likely the other caps are in a failure mode too. A good soldering iron or station is most desirable for this DIY project. Use good lead-free soldering techniques. Inspect your iMac G5 Power Supply too. Bad caps in the PSU can directly affect the caps on the MOB. By the way, get a professional website solution, with Professional Web Services customized websites and Professional Web Services Internet marketing business solution. Get your business discovered online. Contact us for the online sales and marketing solution now. Internet marketing services from Professional Web Services. Note that I have migrated from one blogging platform to another. You can read about the Blogger to WordPress conversion. The comments section is now paginated. If you wish to view all the earlier comments, please use the comment page navigation at the top or bottom of the comments section. Also note that comments are being moderated to avoid the riff-raff. It is absolutely essential to open up the PSU to verify the caps. This should be a matter of normal operating procedure (inspection of the internal capacitors on the PSUs) for all iMacs that are facing problems with video or shut down issues. Yes, there is either a security Torx bit used in 95% of the PSUs, or a tamper proof security Phillips bit that makes the job easier to remove them. However, it still is possible to remove the PSU cover screws even without the proper bit. Try wedging a small screwdriver into the heads to remove them. If you have a voltage meter, you can also measure the DC output voltages under no load to see what is going on with the PSU. Success here with an iMac G5 1.8 MHz 20″ “rev. A” 2004 board which developed cross-hatching video display that would freeze shortly after booting up. Many thanks for this site and the repair kit. #1) I used a Hakko 456 soldering iron picked up locally for $40; no troubles melting solder as it reaches 1100 degrees. #2) I used a lead-free solder wick to remove the solder on the old capacitors. Specifically designed for high temperature, lead free solders. After the first few removals, it took about 5 minutes per capacitor: press the wick-braid onto joint with the soldering iron to hold it in place; wrap the braid around the pin; lift the soldering iron to clamp down on the now-closed circle of braid; heat for a few seconds on a couple sides; pull up off the pin to also mechanically drag the solder out and up. Repeat about 4-5 times per pin. The capacitor could then be just wiggled out easily. Took 2-3 inches of braid for each capacitor, and I ended up the 25-cap project with 3 inches of braid left on the 5-foot roll (very close to needing another roll). Maybe Chip Quik is even faster, but I didn’t miss it. #3) If doing this again, I would have ordered the thermal compound with everything else. The write-up mentions the issue, but I didn’t appreciate the significance or why one would want to do this until it was disassembled. The CPU butts up against a flat plate heat-sink. When you lift out the board out, the existing thermal paste that bridges the CPU/heat sink is disturbed. You need to clean off the old stuff (isopropyl alcohol and a lint-free pad) and apply new thermal compound to the CPU to avoid air bubbles or uneven thermal interface that could damage the CPU. And spring for the Arctic 5 silver compound .. upon reassembly system fans are running 30-50% slower for the same temperatures. Although it turned out the CPU duct was half plugged with dust, so no doubt vacuuming that out was also a big help. When applying the thermal compound to the back of the CPU, spread an even, paper-thin layer across the back using a razor blade. You can get a smooth flat layer that way, without voids. You can also prime (“tint”) the heat-sink side by applying the compound and rubbing it in with a credit card edge. Then wipe it off. This fills in microscopic holes on the heat-sink surface and helps the thermal interface when the CPU is in place. You don’t need to leave the layer on the heat-sink, just the thin layer on the CPU. Keep it clean. Lint or bubbles between CPU & sink can impair thermal performance. So the system works great now. Maybe good for another 10 years …? #4) The only trouble was a little white plastic cone in the corner of the board that channels the light for the front panel power/sleep light. It has to fit down through a congested area of wiring to the back of the front panel casing, and I couldn’t get the board back in cleanly without this cone getting hung up on obstructions. Eventually I noticed there were some guide pins on the back of the front panel. So I took the cone off the adhesive pad attaching it to the logic board, put it through the slot onto the front-panel guide pins by hand, THEN put the logic board in. The board then fit in place and naturally met up again with the little plastic pre-seated cone. The Hakko 456 soldering iron was mainly designed for stained glass work. It definitely was not designed for lead free work. The replacement tips are also quite expensive. “5 minutes per capacitor,” seems exceptionally long for the removal process. Chip Quik definitely makes the process much faster and easier. The light cone is a bit problematic to get through the hole at the same time it is on the MOB, but is still doable. The cone is attached with an adhesive foam to the board. The cone can still be mounted to the board when you install the MOB back into the chassis by guiding the cone through the hole on the frame. If you try to do it the other way, with the cone in the hole to begin with, it is more difficult to line up the little tabs on the cone that go through the MOB. If I do this I get back in the same message again and again, what can I do? I suspect that the software is corrupted on the hard drive. I would try reloading the software. Also, you can try booting to the CD/DVD software disk first, by holding the “C” key down when starting up the computer. If it starts with the software disk, then you know something is wrong with the software on the hard drive. Note, that the capacitors going out on either the MOB or the PSU, can in fact corrupt the software on the hard drive due to ripple voltages and/or abrupt shutdowns. Firstly thanks so much for the information and supplies to complete this project. My 5 1/2 year old imac started experiencing a blue screen on startup a few weeks back (but started ok in safe mode). When I took the back cover off I saw 2 enlarged capacitors. After finding your website I purchased the capacitor kit for my imac along with a few other bits and pieces. I replaced all 29 capacitors, and I just started up my imac a few minutes ago and…success! There’s only one thing I’m slightly concerned about: The CPU temperature is higher than it was before when I was running the temperature monitoring program by Marcel Bresink (running in safe mode previously). When I was running the program with the old capacitors inside, the CPU temperature was getting up to around 59 C with a few programs open. Now with a few programs open it is able to get over 80 C and with all programs closed operates at around 65-70 C. The other readings seem cooler. I did apply a thin layer of thermal paste to the CPU prior to reinserting the logic board, however I am wondering if perhaps I did not apply enough. Do you think this could be the case? * Did you check the PSU caps for bulging? * Verify that all cooling fans are connected and turning. Sometimes there is a lower right squirrel cage fan that is easy to overlook plugging in. * Try resetting the SMU and PRAM. Also, make sure that you are properly seated on the MOB. Maybe the heatsink is not properly making contact with the chip. I don’t think the problem is lack of thermal paste in your case. Do you think that this would work with other Macs, such as my 15″ Macbook Pro? It’s having problems and I’m not sure whether I should proceed with this. I tried resetting SMU and PRAM, virtually everything Apple suggested, and none of it worked, so I want to go with your advice, however, I am not sure whether I should apply it. If you are having a problem with your MacBook, I suspect there are other issues with the MacBook Pros other than capacitors on the logic boards. You might want to place your question on some of the Apple forums to find out what typically happens on the MacBooks when problems occur. Just wanted to say thanks for all the info on your site. My G5 appeared to be headed to the boneyard, but fortunately I took the back off the dead machine before giving it the heave, saw the ugly caps — then did some Googling re: imac G5 bad capacitors. I had no idea all the drama going on! Anyway, of all the sites I read addressing this, yours covered it best from A to Z. So I followed your advice, bought your kits/caps/etc, updated my iron to your recommendation and now have this thing working like new. I can hardly believe it after witnessing its progressive and ugly failure (many kernel panics, hangs, intermittent popping through the speakers, running hot). It now goes to sleep properly (something it stopped doing a couple years ago) and has not crashed or hiccuped once in the two weeks since I completed the repair. Runs quiet and cool now. I would like to join the many people on here thanking you for your excellent work. I have a 17″ iMac G5. This iMac is showing many blocks on the screen. As you move objects around the screen they disappear but reappear a little later. I opened the back cover as well as the PSU and have not found any obvious bad caps. None of them are expanded as your pictures show. Do you think this could still be a problem with capacitors ? Or GPU related. Ok, I thought I would provide an update. I firstly re-balled the imac G5. I don’t recommend this to anyone who hasn’t done about 50 re-balls on large chips. It going to be very easy to lift a pad under the Nvidia chip. This took me nearly 3 hours to achieve. I thought I had nailed the problem. as once i rebooted all was fine for a bout 5 secs, and the original problem resumed. I replaced 2 x 1800uF capacitors. These are the ones closest to the LVDS cable. Once the machine was rebooted. All was fine. i was totally ecstatic. I left the machine on for about 2 hours. The screen went black and fans are on full blast. On closer inspection, the 3rd LED now does not illuminate at all. Do you think i need to replace all the caps. As the remaining caps all look 100% perfect. The once replaced one had the slightest expansion. I always recommend replacing all the caps of both the 1800uF and 1000uF cap groups. It is highly likely that the other capacitors are bad even though you do not see any signs of bulging. What is happening on a lot of the older capacitors, is the electrolyte is drying out, and are simply not filtering the voltage ripple anymore. It sounds like re-balling the chip is a very tough project. Apple changed 2 and a half years ago everything because of bloated capacitors. Now they bloated again. Any chance to go for warranty again? I doubt that Apple would cover it under warranty again. Installed the PSU caps, all connections good to go. Powered up, reset with SMU button. 2. LED lights up, flickers and goes off. Any ideas??? Did I miss something. Checked for cold solder, ok there. You may have something else blown on the PSU in addition to the caps that you replaced. I would double check your voltages. Refer to the article I wrote on Apple PSU voltage measurements for details on pinouts and voltages that should be present. Verify the operating temperatures of the CPU. There are a couple of programs you can use for free that will allow you to monitor the temperatures inside the Apple. Do a Google Search for iMac temperature monitor for more information on the temperature monitoring programs available for the Apple computers. Verify all the fans are working and the fins are clean of any debris which might be clogging up air flow. Try also running from the software DVD/CD disk drive to verify the operating system is not corrupted. It is possible, even though the caps are not bulging, that the capacitors are not functioning. I have seen this on a few occasions. In essence, the caps dry out internally of the electrolyte and no longer filter the voltages. I have a 2006 Intel IMAC that had the graphics issue. I am attempting to replace the GPU silicone. I have opened mine but I cannot understand how to make the 4 screws holding the GPU to release, see photo here: http://www.techdc.com/wp-content/uploads/2008/08/imac07.jpg. there is a heat sink on this board. 4 x black plastic topped screws? with springs under them. I need to release these so I can turn the GPU over and replace the silicone. HOW do I remove these spring loaded screws pls? Woe, I’m not sure you want to mess with that area. I am not sure how that comes apart, or if it was really meant to come apart after it was assembled. I think the spring pins are like push pins, but I am not sure on that particular model. OH OK, it is dead anyway and I had to buy a new 27″ because it is my work machine. 4 yrs old and dead (well useless as the graphics issue rendered it useless), I was not a happy camper. Jim, Much thanks for your excellent site! Very helpful in resurrecting an ’05 17″ G5 iMac given to me by a neighbor. Though it would boot, the screen remained black. Shining a light on it revealed the LCD panel was dark. Diag LED #3 was dark. After pulling the rear off, I saw 3 bulged UCC KZJ 1800uf EC’s, so I decided to pull them all. My first experience with lead-free solder. What a pain. Chipquik saved me and made removal very easy, even with a 45w iron. Amazing stuff. My solder sucker was useless. Used braid instead, but still had to clean up the holes with a tiny carbide drill twirled between my fingers. Spent considerable time board hovering with the magnifier hood on inspecting for tiny solder frags in places they shouldn’t be! (Found several). Resoldered with 60/40. My PS wasn’t listed on your site. Saw no cap defects though. Did find your pin-out diagram, but was hesitant to externally start it in case something had changed. Re-assembly was straight forward. Screen lit on first boot! Left it on for about 5 hours playing a movie to get her good & warm, no worries. Their loss is my gain. These things aren’t cheap! Very pleased I was able to fix it so inexpensively! I have IMAC G5 rev B (2005). I changed the caps (qty 29) and installed new power supply last year. One year later the MAC is dead. Opened up and checked out caps. No bulging that I can see and also did wiggle test. Checked out power supply voltages and everything checkouts. LED 1 and 2 are on but no #3. Turn on MAC, no chime, black screen and then fan ramp up. What to do, should I do the cap replacement again? Check out the thermal paste? Or just punt? Any help again would be appreciated. I don’t think the caps on the MOB are your problem again. I would first try to boot off a DVD/CD software disk. There could be something wrong with the hard drive or the software itself. I would check the caps in the PSU, if you haven’t. Even though, the PSU is new, it is possible that the PSU has bad caps too. It is also possible under loaded conditions that one of the voltages is dropping or has excessive ripple. Got G5 to run for a bit with startup disk. Checked out PS caps and they look good. Ordered HHD WD 750G and installed. Couldn’t get software loaded, no chime, or screen. Opened G5 up and notice one of the MOB caps has hole in it. Replacement time again? Hi Jim, first of all thanks for sharing us your knowledge. Let me tell you that i just did everything you suggest us to do with the vertical-line imac g5 first gen failure but the problem still or even is worst. I paid a guy that has much experience in electrics to change all capacitors; in my perspective seems to be everything perfect. The thing is that the vertical lines still there and even freezes with the apple at the startup. Checkin the leds and based on your post about them, everything apparently is working fine. The one that changed all the capacitors, that by the way is my friend, double-checked everything and seems to be ok.
Is there anything that you could suggest me about?. @ Caesar, I have the same problem with my 20″ G5 ALS, led’s 1 & 2 but no 3 I have spent hours googling and tried every suggestion but to no avail. Mid April I was typing an email and she froze solid. Had to unplug her to power off. Since then got a chime out of her a couple of times, but that was it, once about a month ago I even got to the login screen! Can’t start from original disk so went out and bought new iMac and some firewire to attempt running old one in target disk mode. Same thing, no chime, sometimes white light on front, sometimes not, not so much as a flicker from screen, and then the turbo fans kick in. Just a side note that I had the power supply replaced once under warranty and again 2 yrs ago, and MOB replaced around then too, well out of warranty but after a 45 min. phone call working my way up thru the ranks at Apple they made good and covered it all! Caps look/feel good as far as I can see. So frustrating as I have some stuff I hadn’t backed up stuck in that old G5, I guess I am going to have to take her in to the pros, or pull out the hard drive… unless someone has a similar experience and can suggest anything? Thx! Thank you very much for those informations. I just replace 3 caps as you indicated. Procedure is not quite easy and requires a serious magnifying glass to respect the soldering surface. Must use a 100w soldering material and shake the caps to preserve the hole when you remove it (or the hole will be filled will by the welding and an extra time consuming operation will be necessary). So “3 hours” is a good duration to envisage (I’m not a “pro”). iMac G5 20″ is displaying well again. Good idea about keeping the screws in the proper order. However, I always recommend that you change all the capacitors in both groups. Even though the other capacitors might not be bulging, I can assure you that they are most likely weak, dried out electrolytic juice, poor performance, and/or will be going out very soon, and even cause the few new caps you just put in, to work that much harder to keep the voltage ripple to a proper level. Not only does this affect the main logic card, but it also affects the PSU too. I am suspecting that something else in the graphics area is bad. You might try an external monitor plugged in to see if the lines appear. You might even try booting off the software disk to make sure the software installed on the hard drive is not corrupted. Additionally, I would also open up the PSU and check those capacitors. You could also check the voltages (refer to my article on measuring the PSU voltages in the Apple menu link). I received the cap kit for my iMac g5 17? 1.8GHz. All five of the five 1000uF caps were bulging and none of the 20 1800uF caps. I replaced the five 1000s and 2 of the nearby 1800s. I stopped there because of the extreme difficulty in removing the residual solder from the holes. I had 60w iron. Plenty of heat to remove the caps but tried the various methods to clear the holes and that was difficult. Rather than risk damaging the PCB from excessive heat and manipulation, I left the non-bulging 1800s in place. All of the original 25 caps on the logic board were not Rubicon but rather Nichicon HN(M) ultra-low ESR high reliability. I also replaced 2 slightly bulging caps in the power supply. I put it all together and it worked perfectly. If I have problems in the future, at least I know how to do it and I have the caps. I used the old-style 60/40 solder (’cause I had it and figured it would be easier to work with) and made sure to apply enough heat to get the lead-free melted for a good bond. That wasn’t too hard. For fun, I measured the DC and AC voltage on the power supply without load. The AC voltage was .02-.03 v on all voltages except the 24v had a measured AC of about .1 v. That seemed like a low enough ripple to be OK. The Apple detailed take-apart manual that you link to was very helpful. The manual was a little different in a few areas. 1) The lower fan does not need to be removed and is not plugged into the logic board as shown. In fact, it can’t be removed as shown. My iMac does not have the ambient light sensor and the manual was probably different for that reason. One day later but before I had the chance to post the above: It worked perfectly for about three hours. Then it would boot or partially boot and show various defects in the visual display, and then sometimes show a multi-language message saying you have to restart your computer. I then replaced all the remaining 18 caps on the motherboard. After reassembly, it showed the same problems as above. On one occasion it fully booted and showed the normal desktop but about two seconds later it had the “you must restart” message. What to do from here? Perhaps it is a power supply issue though the measured no load DC and AC voltages (see above) seemed OK. I guess I could attempt to measure under load if I knew the location of test points on the logic board. I could also rig up a resistive load and measure the power supply voltages out of the case. I assume that somewhere on the web one could find the current draw at the various voltages. Yes, it still could be the PSU. However, I would also try a cooling test. Maybe the PSU is overheating due to other capacitors being bad even though you replaced the two obvious bulging ones. Try opening up the back and place a fan blowing on the main computer heatsink. If you get to the point where it will boot, I would try loading in the temperature monitoring program, available online for free. Note also, that with the back cover off, the computer does not pull air through the PSU vents as it would when the back cover is on. I would double check all your soldering to make sure none of the caps have cold solder joints. Also, you might try booting from the CD/DVD. Maybe the software is corrupted.